61st GRAMMY Awards printable ballot (2019) - UPDATED! 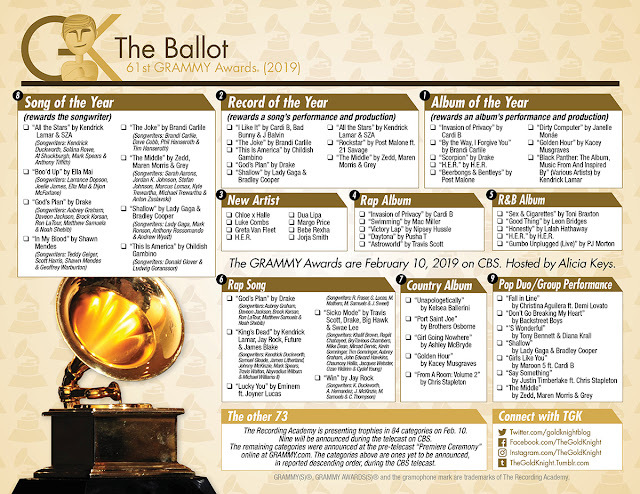 Our latest download for you is for the 61st GRAMMY Awards. Find a selection of the nominees here in our handy GRAMMY Ballot. Download the ballot, print it out and pass out during your party. 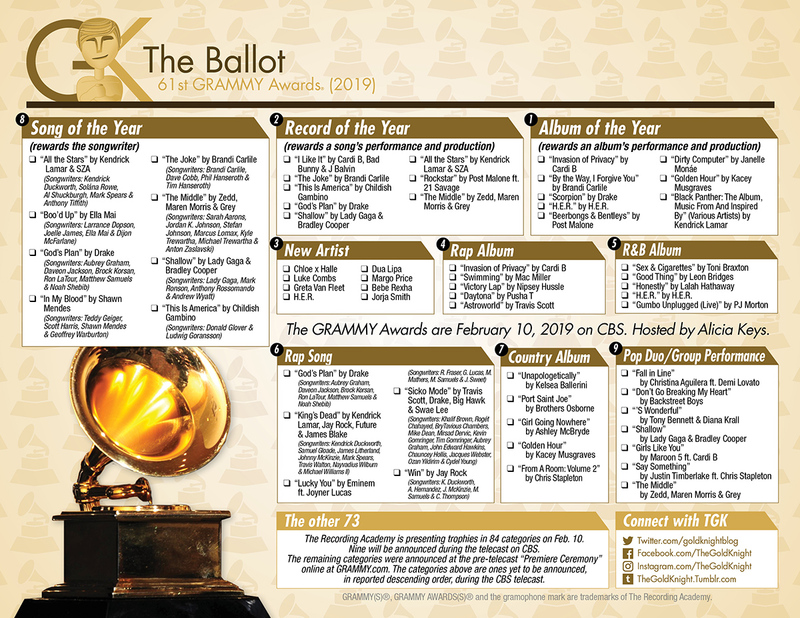 Our latest download for you is for the 61st GRAMMY Awards. Find a selection of the nominees here in our handy GRAMMY Ballot. Download the ballot, print it out and pass out during your party (go here to download the updated PDF). It's in glorious color. We've update our ballot with the remaining categories and reported order to be announced (thanks to @fischerlemos on Twitter). We also have included definitions for Song, Record and Album of the Year because those categories can be confusing. The Recording Academy is preparing to present trophies in 84 categories on Sunday, Feb. 10 — back in Los Angeles after broadcasting from New York City for its 60th anniversary. Between 8 and 12 categories will be announced during the telecast on CBS. 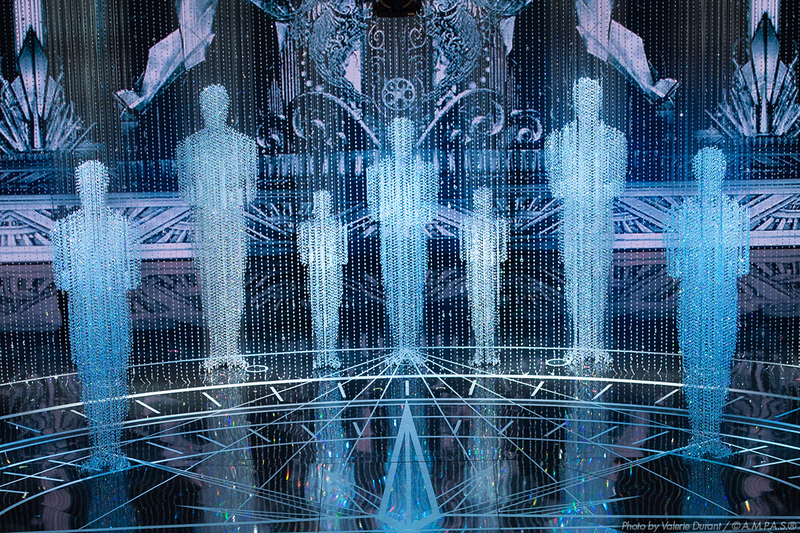 The remaining categories will be announced at the pre-telecast "Premiere Ceremony." Watch it online at Grammy.com starting at 3:30 p.m. ET / 12:30 p.m. PT. NOTE: The categories on our ballot are ones that have been presented in recent years during the ceremony. The Grammys doesn't announce which categories will be announced live. We'll see who takes the top honors this Sunday! The show will, of course, be filled with memorable performances. We're looking forward to GRAMMY winners Yolanda Adams, Fantasia, and past GRAMMY nominee Andra Day honoring the legend Aretha Franklin. The 61st GRAMMY Awards will take place live on Sunday, Feb. 10, live back at STAPLES Center in Los Angeles and will be broadcast on CBS at 8 p.m. ET / 5 p.m. PT. Alicia Keys is set to host. 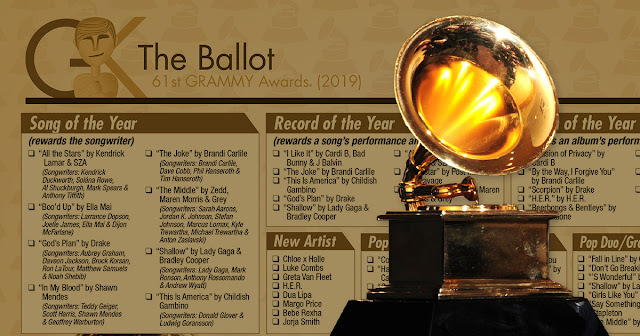 The Gold Knight - Latest Academy Awards news and insight: 61st GRAMMY Awards printable ballot (2019) - UPDATED!